Sleuthing out the difference between a toby jug and a character mug is elementary; jugs have a spout on the rim for pouring, while mugs are straight along the entire rim. A typical character mug is molded to represent just the head of a subject. A toby jug is fashioned into the full figure of a plump, jolly man named Toby Fillpot, who was said to have died from overindulging in drink and tobacco. Toby jugs depict their namesake dressed in a long coat and a tricorn hat, which forms the pouring spout. Toby also holds a mug of ale in one hand and a pipe in the other. In researching a bit more, we learned that the Toby Jugs and Character Mugs are popular with men. Maybe you’ll want to consider adding to your favorite guy’s collection (or help him start one)! 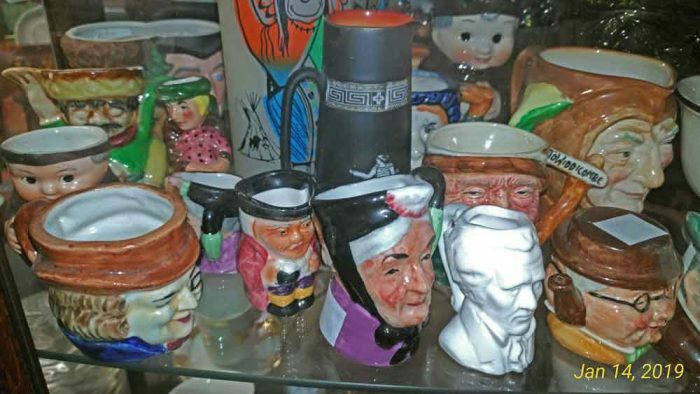 If you’re so inclined (or that serious a collector), you may want to visit the American Toby Jug Museum in Evanston, Illinois. Stop by Bahoukas Antique Mall and Beer MuZeum soon and see more of this particular ‘collection of collections.’ Yes – we will be watchin’ for ya!